Performers include: Clive Owen, Andre Holland, Jeremy Bobb, Juliet Rylance, Eve Hewson, Michael Angarano, Chris Sullivan, Cara Seymour, Eric Johnson, David Fierro, and Matt Frewer. A period drama, this TV show is set in downtown New York City in 1900. It revolves around the Knickerbocker Hospital and the groundbreaking surgeons, nurses, and staff who work there. They push the boundaries of medicine in a time of astonishingly high mortality rates and zero antibiotics. A brilliant surgeon, Doctor John Thackery (Clive Owen) is pioneering new methods in the field, despite nursing his secret and severe addiction to cocaine. He leads a team of physicians that include his protégé Doctor Everett Gallinger (Eric Johnson); young Doctor Bertie Chickering Jr. (Micahel Angarano); and Doctor Algernon Edwards (André Holland), a promising surgeon of color who’s been recently thrust upon him. Others at the hospital include benefactor Captain August Robertson and his daughter Cornelia (Juliet Rylance); surly ambulance driver Tom Cleary (Chris Sullivan); fresh-faced nurse from the country Lucy Elkins (Eve Hewson); crooked hospital administrator Herman Barrow (Jeremy Bobb); and Sister Harriet (Cara Seymour), a nun who isn’t afraid to speak her mind. There’s also health inspector Jacob Speight (David Fierro), a coarse man who’s not above taking a bribe to steer a patient to a particular hospital. Thackery eschews Zinberg’s advice at Mt. Sinai and opts for a dramatic, and risky, alternative course of action. Cornelia confronts Henry about his role in the family business; Barrow defends his actions at the hospital construction site; Gallinger considers a job opportunity; Cleary refuses to give up on Harriet. What do you think? Do you like The Knick TV show? Do you think it should have been cancelled or renewed for a third season? Fantastic show. Should not have been cancelled? Right after Cinemax canceled “The Knick”, I canceled Cinemax. Why do ALL THR GOOD SHOWS GET CANCELLED? 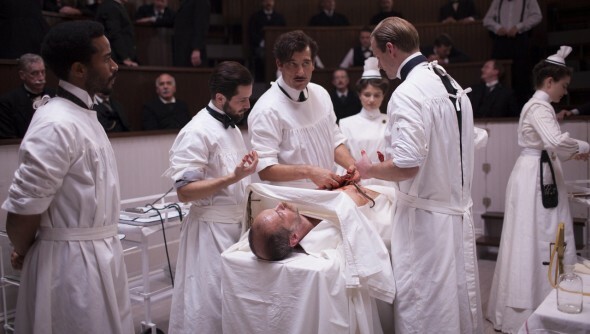 The Knick could not have been canceled due to RATINGS, the RATINGS WERE EXCEPTIONAL!!!! This is such a DISAPPOINTMENT!!!! No the Knick SHOULD NOT HAVE BEEN CANCELLED!!!! In my opinion it was Cinemax’s BEST SHOW!!!! BRING THE KNICK BACK PLEASE!!!! My husband and I love The Knick! Were so sad to see it cancelled. What could be done to get it back? We can relate to the medical profession as a scientist and the daughter of a physician…..this series touched areas others haven’t. The mix of history and drama made it real. I loved the Knick, devastated that it’s been cancelled! I loved the acting and the twists throughout. As a surgical nurse, loved the OR scenes! I just finish watching The Knick. I was so disappointed when I realized no season 3. I’ve been rob!